In this interview researcher and pharmacist Dr. Katie Suda discusses work she and her colleagues published in the May 2016 issue of the Journal of the American Medical Association (JAMA). This publication has garnered considerable public attention after finding an alarming rate of inappropriate antibiotic use in the ambulatory care setting. The following are questions answered by Dr. Katie Suda, co-author of the recent JAMA publication Prevalence of Inappropriate Antibiotic Prescriptions Among US Ambulatory Care Visits, 2010-2011. You can learn more about Dr. Suda here. 1. How did you get involved in researching the use of antibiotics in ambulatory care? As an infectious diseases and outcomes research pharmacy fellow I had the opportunity to analyze a database of dispensed antibiotic prescriptions and diagnoses codes (ICD9s) from a national prescription benefit manager (PBM). Even though I never learned computer programming, I was able to write code to analyze and connect the large datasets. I was shocked at how many antibiotic prescriptions were prescribed for upper respiratory infections; many for influenza or rhinosinusitis without another infectious disease ICD9. It was also the first data on dispensed outpatient antibiotic prescriptions in the U.S. Since Europe had been aggregating and reporting this data for some time, I started attending European infectious disease conferences to present my work and learn about their methods. From this one project, I was hooked into using big data for research! I have now progressed to using even larger datasets representative of the U.S. population. 2. Regarding your recent JAMA paper, are there two or three key findings that pharmacists would be most interested in? 1. At least 1 in 3 antibiotics prescribed in primary care clinics are inappropriate – approximately 47 million antibiotic prescriptions annually! 2. Greater than 40% of outpatient antibiotic prescriptions were prescribed for acute respiratory infections; half of these prescriptions were likely unnecessary. 3. Antibiotics are never appropriate for: bronchitis, viral upper respiratory infections, bronchitis, asthma/allergy exacerbations, influenza, viral pneumonia, and nonsuppurative otitis media (ear infections without pus). Antibiotics are rarely appropriate for sinusitis and pharyngitis (especially in adults)! 3. In your opinion, what can pharmacists do to reduce inappropriate antibiotic use in the ambulatory care setting? All health care professionals will need to be engaged in antimicrobial stewardship in order to meet the national goal of decreasing inappropriate antibiotic use by 50% and overall outpatient antibiotic use by 30%. As the most accessible health care professional, pharmacists are well positioned to influence antibiotic use. Community pharmacists can focus on prevention, adherence, and patient counseling. They can encourage healthy lifestyles, such as vaccination, health screenings, and patient education. Educational programs on appropriate antibiotic use and treatment of viral illnesses delivered just prior to the flu season may be the most effective. Besides routine patient counseling, education can also include educational posters hung in the pharmacy and leaflets on appropriate antibiotic use included with prescriptions dispensed prior to and during influenza season. As part of medication therapy management, pharmacists should screen for antibiotic-drug interactions and provide patient instruction on their medication. In addition, over-the-counter medications can be recommended for the management of symptoms of viral illnesses. Community pharmacists can also participate in antibiotic call back programs to verify adherence and evaluate for the presence of adverse drug events. In addition to the above, pharmacists with clinically-focused roles can perform audit and feedback on appropriateness of antibiotic prescribing overall and based on agent selection, dosage, and duration (since these pharmacists have access to the health record). In addition, ambulatory care clinical pharmacists can be lead the implementation and dissemination of antibiotic stewardship initiatives in outpatient health care settings. This may include evaluating current prescribing for infections where antibiotics are never or rarely appropriate. In addition, they can provide education to providers and patients, establish disease management pathways, clinic-specific guidelines for antibiotic prescribing, and participate in academic detailing initiatives. Pharmacist administrators and those with organizational-level roles can assist with data aggregation, formulating antimicrobial stewardship resources and educational tools, formulary selection/criteria for use, and providing socially responsible services. All pharmacists can get involved with stewardship efforts in their community and participate in stewardship advocacy initiatives. 4. Do you expect antibiotic use in the ambulatory care setting to improve rapidly in the future or do you think this is something that will take a long time? Nationally, antibiotic prescription rates are slowly decreasing and, with the attention stewardship has achieved, these rates will likely continue to decrease. However, we have a long way to go to reach the national goals. Pharmacists engagement is key to achieving the national goals aimed at reducing inappropriate antibiotic use. 5. What resources would you recommend to pharmacists who want to learn more about this topic? The Centers for Disease Control and Prevention (CDC) has resources specifically designed for community pharmacists available here. This includes a pre-recorded educational program, web tools, and print materials (tailored to adults, caregivers of young children, and healthcare professionals). In addition, information on antibiotic use and resistance and evidenced-based methods to increase appropriate antibiotic prescribing is available on their website. The CDC also has documents that emphasize the threat of antibiotic resistance and core elements to antibiotic stewardship that may be of interest. The Pew Charitable Trusts has provided a report on antibiotic use in outpatient settings and information on the antibacterial drug development pipeline, available here. There are also guidelines for antimicrobial stewardship programs available on the Infectious Disease Society of America (IDSA) website. While these guidelines are focused on acute care, there is a good introduction on the basic principles of antibiotic stewardship. There are also other guidelines on the treatment of commonly encountered infectious diseases in the community on this website. Finally, stewardship certificate programs are available (e.g, SIDP certificate program and MAD_ID certificate program). 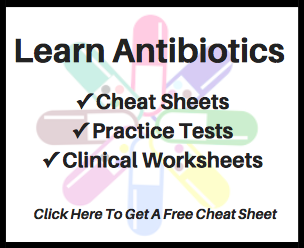 Most of these programs are excellent and appropriate for any pharmacist in any practice area who are interested in improving their knowledge of antibiotic use and methods to improve antibiotic prescribing. I would like to express my sincere thanks to Dr. Suda for taking the time to provide this content above and help spread these important messages about antimicrobial drug use. Sign up for the monthly newsletter! Twitter For Pharmacy Students Studying Infectious Diseases: Useful Or A Waste Of Time?